Nurses, are you ready to take action? This next guest reminds us that it takes more than a dream to reach a goal. Let’s get to the motivating conversation ahead. And why you may need to remove barriers- even challenging ones- to reach your goals! From a clerical beginning in healthcare to LPN and now RN, Patricia Laramee, RN has worked in a variety of positions from home health to walk-in clinics to intensive care to hospice. In 2007, Patricia began a CNA Test Prep program, wrote a study guide and in 2012 she published CNA Skills Videos on YouTube. 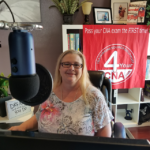 Now, with over 12 million views and 30,000 subscribers, she has launched a completely free online CNA test prep course to get students ready to pass the CNA state exam. You can find out more and connect with Patricia via her website, Facebook, LinkedIn or YouTube.